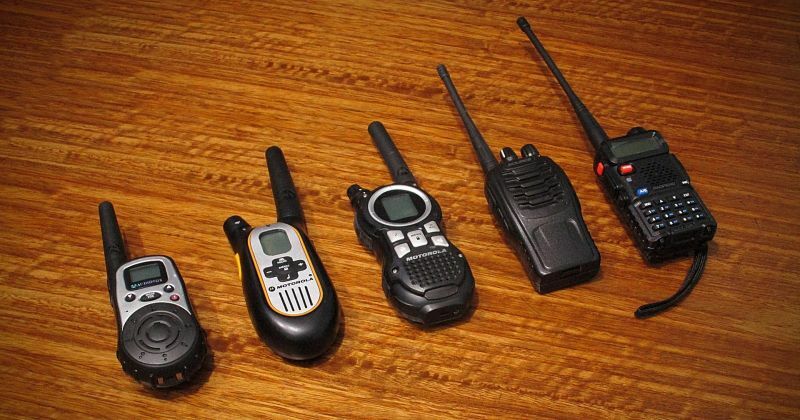 One frequently asked question is “Do all walkie-talkies work together?”, for example walkie-talkies of different models or even different brands. I will discuss that question in this article. Before giving you an answer to this question you should have a basic understanding of how two-way radios communicate with each other. Walkie-talkies transmit radio signals on a specific frequency, and if you want to communicate with another walkie-talkie your both devices should be tuned to the same frequency. In the United States, consumers can use Family Radio Service (FRS) and General Mobile Radio Service (GMRS). These services operate in the 460MHz range. There is also a separate business band for corporate users, which operates in the 450 to 470 MHz range. And finally, there are specially reserved frequencies for law enforcement agencies such as police to prevent overlap with the public space. So do all walkie-talkies work together? In theory, all walkie-talkies can communicate with each other if they operate on the same frequency, model and brand should not matter. This holds true for walkie-talkies targeted at consumers, but you should not expect this to be the case for business radios. Walkie-talkies targeted at consumers use a standard set of frequencies, either FRS, GMRS or a combination of both. All radios that support FRS and/or GMRS use the same frequencies, so they are compatible with each other. If you use the same channel and privacy code on your devices you should be able to communicate with each other, model and brand should not matter. For a start, business radios can use different types of frequencies, for example, VHF, UHF or the 800/900 MHz range. So the first thing you have to check if you want to use business radios of a different model and/or brand with each other is if they operate on the same type of frequency. If not, you will not be able to use them together. Furthermore, business radios also often support the programming of custom frequencies. So even in the case your radios use the same frequency type, it is still possible that you cannot communicate with these radios because they have different frequencies programmed. So if you want to buy a new business radio to use with radios you already own but you are not sure if they will work together you should really ask some advice from an expert to prevent surprises. I have a question I can’t find a definitive answer for. Can a strangers walkie talkie make ours ‘ring’? One of ours was left on and it started ringing. When my son answered it there was someone on the line. Yes, this is something that can happen. If two walkie-talkies are set to the same frequencies and one of them sends a “call tone” then it’s possible the other walkie-talkie makes a notification sound. If this happens a lot you can try changing the frequency you use on your device, because some frequencies are more common and thus the chance of interference is much higher.